Stitch Fix is like Christmas morning once a month. When that box arrives on the porch, it’s just that exciting. Well, it would probably be more exciting if I wasn’t a cheater. So there’s an app and when your item ships you can see what’s coming in advance. I know, I know. But I’ve never really liked surprises. Surprises equate to me not being in control. And I really don’t like that. 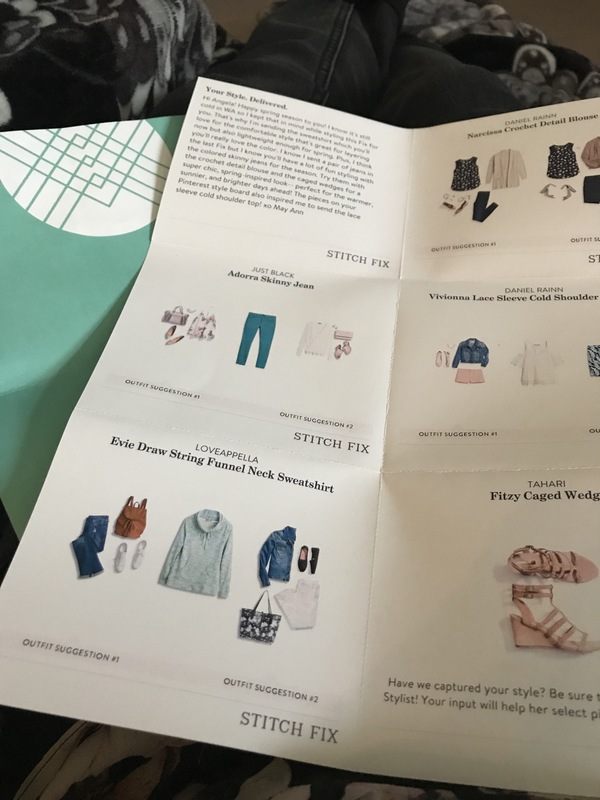 When I first heard of Stitch Fix from a coworker, I turned to Pinterest to see what the heck it was all about. I found people who posted a reveal for each of their fixes and I used that info to create my Stitch Fix inspiration board. When you sign up, you fill out a style profile and then when your first fix is being styled you are charged a $20 styling fee that is non-refundable. So you should basically keep at least one item to make it worth it. After I received my first fix, I kept only two shirts. The next fix I kept everything. When you keep everything you get a 25% discount so you basically get at least one item free. I’m on my 18th fix…and I’m obsessed. I don’t have to go out and shop and try on clothes and get frustrated when I can’t find anything. On average I spend $50-$100 a month because I attempt to remain on a budget and choose only one or two items. If I keep everything, it’s closer to $250. It seems like a lot, but it is so worth the splurge. The quality is great. The shoppers personalize your fixes and they truly are tailored to your style and preferences. And they get better and better as you go on…especially if you get the same stylist. But YOLO and I really feel the need to spread the fashion joy! The detail on this top is adorable and the fit is my fave…flowy. You know away from the mommy muffin top. The print is cute and it totally made me jazzed for summer. I was originally going to keep these because I needed a replacement pair of tan strappy wedges. You know NEEDED as in who doesn’t always NEED a new pair of shoes. I loved the fit and the style (even with my pasty white skin). But I started to second guess myself on the price. I looked up a pair of American Rag strappy sandals that I’d been eyeing at the end of summer last year and they were on sale at Macy’s for $30 (with my Macy’s coupon). So I really couldn’t justify $99. Therefore, I’m returning them and keeping something else. When I was cheating and looking at the app, I thought I’d love this sassy little number. But no. It’s awkward. Or I’m awkward. Either way it’s just too much awkward for me. Oh, but these jeans came from my last fix and they are my favorite. I really liked the color, material and fit. Except for the neck. What the heck are you supposed to do with all that material. More awkwardness…so it too went back. Overall, I was satisfied with my fix and I’m counting down the days until May 26 when the next one arrives. I love Stitch Fix too! They send me items I’d never choose myself but that I love! Great service and your Fix is adorable! Super cute! And yes, the prints and colors scream summer! Thank you! Isn’t Stitchfix the best!